The Story: A text found on papyrus used on a mummy mask may be the oldest copy of a gospel known to exist—a fragment of the Gospel of Mark that was written during the first century, before the year AD 90. Until now, the oldest surviving copies of the gospel texts date to the second century (the years AD 101 to 200). The Background: In 2012 Daniel Wallace, a New Testament scholar at Dallas Theological Seminary, mentioned in a public debate that researchers had found a fragment of the earliest copy of the Gospel of Mark. This weekend, another scholar, Craig Evans, a professor of New Testament studies at Acadia Divinity College in Wolfville, Nova Scotia, reconfirmed the existence of the fragment. This text was written on a sheet of papyrus that was later reused to create a mask that was worn by a mummy. 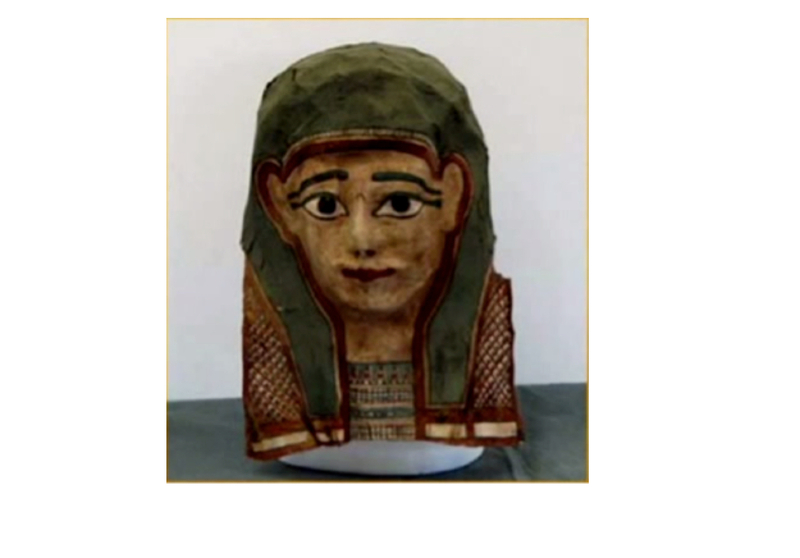 Although the mummies of Egyptian pharaohs wore masks made of gold, notes LiveScience, ordinary people had to settle for masks made out of papyrus (or linen), paint, and glue. Given how expensive papyrus was, people often had to reuse sheets that already had writing on them. Scientists have developed a technique that allows them to remove the text from the mask without harming the ink on the paper. The gospel fragment is one of hundreds of new texts. “We're recovering ancient documents from the first, second and third centuries. Not just Christian documents, not just biblical documents, but classical Greek texts, business papers, various mundane papers, personal letters,” Evans told Live Science. Evans also told Live Science that the text was dated through a combination of carbon-14 dating, studying the handwriting on the fragment and studying the other documents found along with the gospel. Because of a nondisclosure agreement, Evans said he can't say more about the text's date until the papyrus is published later this year. Why It Matters: Andreas J. Köstenberger and Justin Taylor have argued that the evidence suggests the exact date of Jesus crucifixion was April 3, AD 33. A fragment from before AD 80 would establish that the Gospel of Mark had not only been written within 50 years of Jesus’ death and resurrection, but that it would have already begun to circulate widely. Last year at the 2014 Apologetics Canada Conference, Evans talked about the discovery of the fragment.